This resource is just one of the amazing resources included in our Complete 1st Grade NGSS Physical Science Unit. Use this sort to get students thinking about why instruments make noise-because they vibrate! 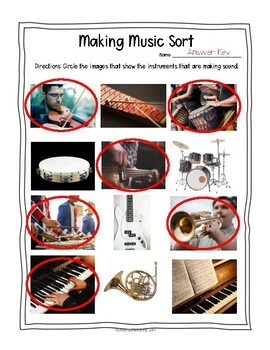 Students need to identify which photos shows an instrument that is making noise. 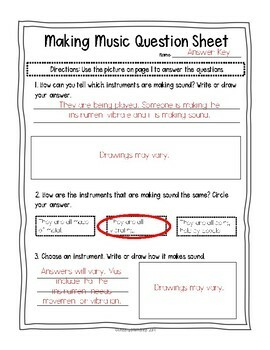 Then they will use the question sheet to explain their thinking and summarize what they know about vibrations and sound! 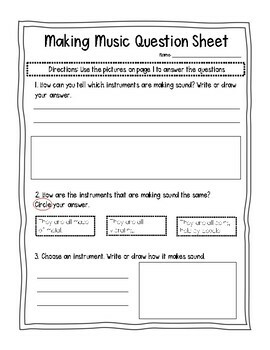 Check out the complete 1st Grade NGSS aligned hands-on lesson and guitar building guide with our I’m In the Band activity. (1-PS4-1) Plan and conduct investigations to provide evidence that vibrating materials can make sound and that sound can make materials vibrate. 1st Grade NGSS Earth Science COMPLETE STEM UNIT!! Over 50 resources! Moon in Motion Activities & PPT! BONUS Engineering Challenge! It pays to follow my store! all new products are 50% off for the first 48 hours! Just click the green star to follow and you will be the first to know when new products are posted. Please leave feedback on your purchases. You can earn TpT credits to use on future purchases just for doing so. If you have any questions or concerns about a product please email us at onestopstemshop@gmail.com or choose the "Ask a question" option and we will help you in any way that we can!